This is an update to a previous blog post where I described how I was able to use custom fonts in my docbook -> dblatex -> pdf toolchain by switching to the XeTeX backend. I’m pleased to say that I’ve recently revisited my publishing toolchain and two of those three caveats are no longer an issue. Parameters to define page sizes and margins. Parameters to have crop marks for pre-press PDF output. Fix Debian bug #629514 to have draft watermark with XeTeX backend. 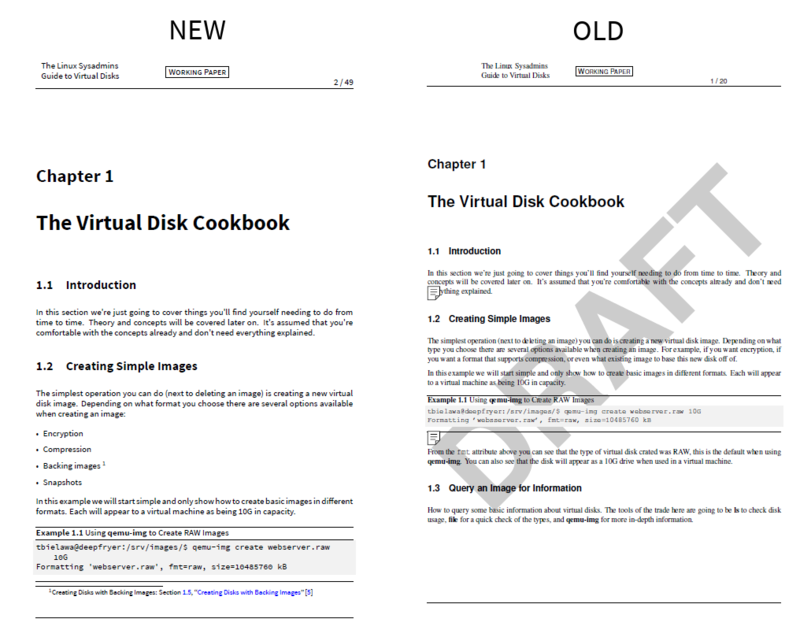 Because I’m targeting smaller book dimensions for the Virtual Disk Guide I was most interested in the first fix mentioned: the removal of hard-coded paper sizes. Unfortunately, the documentation on the official dblatex site has not been updated in quite some time. It seems that they’re still displaying an early 0.3.x release of the docs. Wouldn’t you know it… Some kind souls out there on the Internets have actually built and host the most recent version of the dblatex documentation online! Now I’m able to get a smaller page format which is suitable for the dimension options on lulu.com without having to directly hack any of the dblatex styles. All it takes now is: <xsl:param name=”paper.type”>a5paper</xsl:param> Header and footer content receive appropriate margins automatically, too. No more fussing around! The draft watermark works in PDF output once again. Hyphenation in examples works correctly again. The problem I ran into is that dblatex has no stylesheets or templates built in to handle DocBook acknowledgements elements. Acknowledgements sections should be fairly simple to render I thought. You really just need a chapter header, and then to process the block elements, like paragraphs, blockquotes, and what have you. To me, the same template used for Colophon sections would create an ideal acknowledgements section. 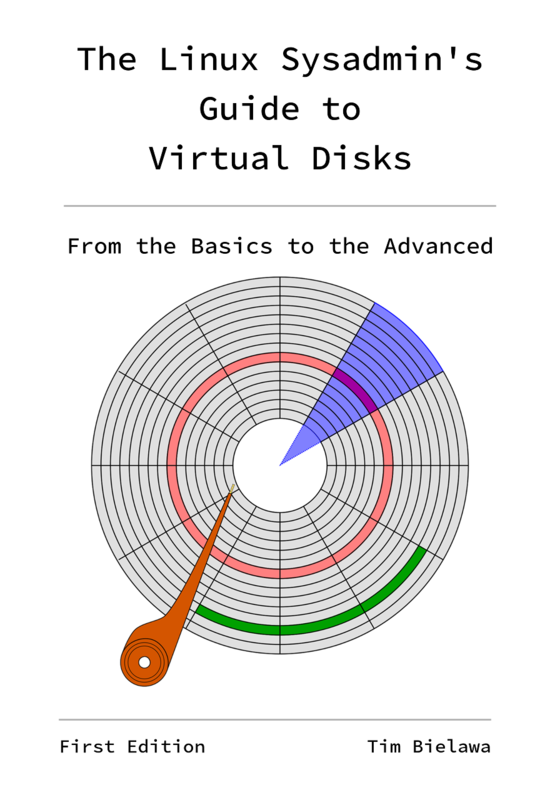 For an example of how this renders you can look at the PDF version of the Virtual Disk Guide. I keep the file in version control on the github project for the book. Speaking of Acknowledgements: Thanks to my buddy Al for dusting off his XSLT skills and debugging this with me initially. 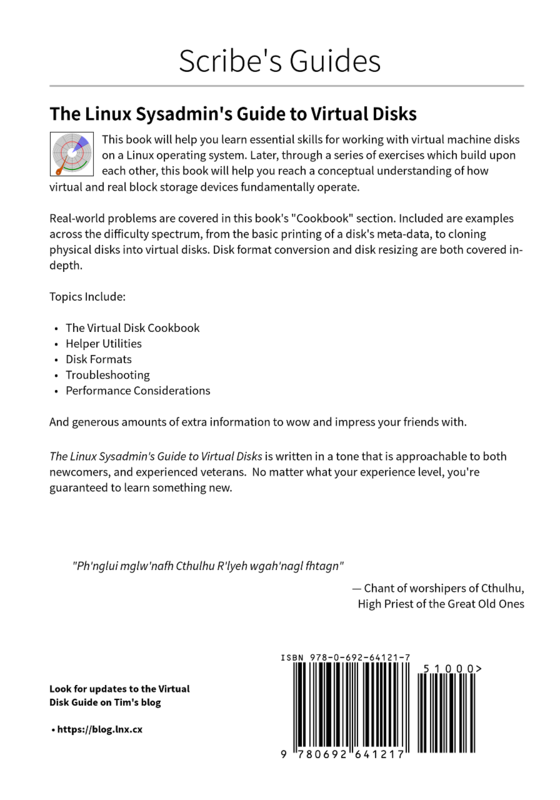 I’ve been working on my book, The Linux Sysadmins Guide to Virtual Disks, since my post about long-term goals a few months back. I think it’s about time I post some updates. Disk Concepts “Formatting Partitions” has been overhauled completely. This is what inspired the new disk drive information major-section.